Product review: New Farmhouse Fresh Three Milk Ageless Night Cream firms and hydrates with retinol, advanced firming peptides and botanical milks. How much would you give for a night cream that delivers glowing, lusty, silky smooth by morning? Maybe a couple hundred bucks? Your first born? How about $45? Well, hang on to your spa slippers. Farmhouse Fresh has unleashed a night cream that I swear to you, although it doesn’t say it on the label, has a shot of magic in it and is worth every dollar. Three Milk Ageless Night Cream from Farmhouse Fresh is truly nothing like any other nighttime potion I’ve used before. The texture of this deliciously luxe cream is so thick that after gliding it over your face and neck (don’t forget your neck! ), you’ll notice a glowing protective barrier, which allows the ingredients to their thing while you sleep. By morning, the time-released harmonious ingredients have penetrated the skin leaving it smooth, hydrated and firmed. So what’s in this stuff? Among the carefully culled blend of ingredients, you’ll find a few key vitamins, extracts, and moisture-boosting botanicals that make Three Milk Ageless Night Cream so effective including pure-form retinol, coconut milk, milk thistle and advanced peptides. Retinol (vitamin A) helps smooth lines while firming and improving skin texture. Nutrient-rich coconut milk hydrates and soothes skin. Milk thistle contains silymarin, a dermatologist-recommended antioxidant that tamps down redness and itching, while amping up hydration. 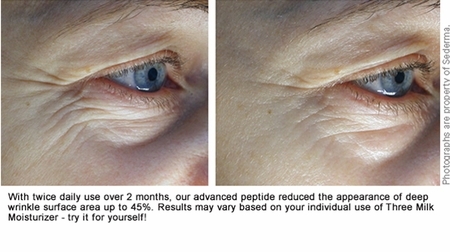 The kicker is the advanced peptides, which diminish the look of deep wrinkle surface area by up to 45% after two months of use (the company has clinical studies with female participants on file). While many retinol products can cause redness and irritation, Three Milk Ageless Night Cream is formulated with a slow-release system that ensures the formula delivers softness, illumination, firmness and hydration—without the side effects normally associated with pure-form retinol. The formula is also free of parabens, sulfates and mineral oil. I just realized they make a Three Milk Ageless Day Cream. Oh, it’s on. Three Milk Ageless Night Cream from Farmhouse Fresh comes in a 1.7 oz glass jar with decorative box and sells for $45 at www.farmhousefreshgoods.com. Are you already a fan of Three Milk Ageless Night Cream from Farmhouse Fresh? Give us a shout in the Comments section below and let us know what you think of it!